Perhaps best known as the scourge on an otherwise stellar career, there is much to say both good and bad (but mostly bad) about the outlandish, over-the-top movie musical Mamma Mia! Loaded with a soundtrack of Swedish pop music from the likes of supergroup ABBA, Ms. Streep finds herself singing and dancing, something that typically serves as pleasant surprise in her films. Though her vocals are rather good, it's hard to transcend the ridiculous plot, which clearly has been haphazardly strung together through the lyrics of unrelated ABBA songs. But before I get ahead of myself and start discussing the quality of the movie itself, let's first take a look at the performance within the mess. The best way to describe Streep's Donna Sheridan, the former wild child whose daughter is desperately seeking her biological father from the crop of paramours her mother bedded through the years, is amiable. You can see the desperation on Streep's face throughout the movie - she realizes it's a disaster, but she's giving every ounce of energy she's got to attempt to rescue it. Exhibit A - no other person in the cast seems to have been screened for vocal talent before shooting (except for maybe Christine Baranski), so Meryl manages to be the stand-out vocalist by default. Exhibit B - the whole randy fiftysomethings vibe is a little too wacky for words. While Meryl's busy with dialogue about euphemistic "drilling" and what have you, her pals are busy desperately begging for love from strange men and hitting on youngsters that could be their grandchildren. 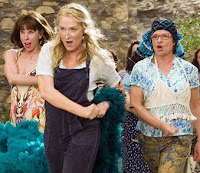 Exhibit C - perhaps the biggest travesty, Streep is relegated to overalls for the former half of the flick. Oh, and then there's the 60s/70s, platform-shoed getup she dons for her daughter's bachelorette party. 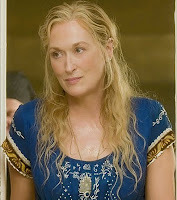 Honestly, if it weren't for "The Winner Takes it All," it'd be a complete waste of Streep's talent. As for the movie, aside from Streep and Amanda Seyfried (who's at least enjoyable to watch for the most part), the duration amounts to a bunch of older gents and gals parading around like wild teenagers and warbling uncomfortably. If you want a true ABBA tribute movie, check out Muriel's Wedding instead. I understand that it's harmless fun, but there's something to be said for at least trying to find actors with a modicum of vocal ability. I'm all for Meryl finding herself in musical films, just so long as the script is a lot more cohesive and a lot less hammy. I don't think I'll ever get tired of talking about how awful Pierce Brosnan is in Mamma Mia. It's a hobby of mine. This movie scares me simply because of all the marketing on TV it had just before the movie came out. It was insane and the TV spot had the volume turned up really, really loud and it would startle you every single time the ad came on. Poor thing, it's so bad and it knows it, but Meryl was so much fun. After watching her jump all over a roof and act like a teenager when she sings the title song I actually asked myself out loud in the theater: is there anything this woman can't do?